The 1866 New York state election was held on November 6, 1866, to elect the Governor, the Lieutenant Governor, a Canal Commissioner and an Inspector of State Prisons, as well as all members of the New York State Assembly. Besides, the voters were asked if a Constitutional Convention should be held in 1867, which was answered in the affirmative with 352,854 votes for, and 256,364 against the convention. The delegates to the "Conservative Union" state convention arrived on September 10 at Albany, New York. This convention was the result of the still ongoing party re-alignment after the American Civil War. It was called by the Democratic Party with the intention to give the War Democrats, who had joined the Republicans in the National Union, and other conservative Republicans, an opportunity to return to the Democratic Party. Thurlow Weed was a delegate. John Adams Dix was talked of to be nominated for governor. The convention met on September 11 and 12 at Tweddle Hall. Sanford E. Church was temporary chairman and president. Mayor of New York John T. Hoffman (a Democrat of Tammany Hall) was nominated for governor by acclamation. Robert H. Pruyn (a Republican) was nominated for lieutenant governor on the first ballot (vote: Pruyn 169, Harlow L. Comstock 85). William W. Wright (who had been Canal Commissioner from 1862 to 1863) for Canal Commissioner, and Francis B. Gallagher for prison inspector, were also nominated by acclamation. 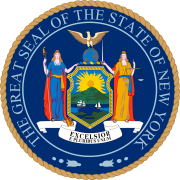 82 Republicans and 46 Democrats were elected for the session of 1865 to the New York State Assembly.